Last week, we were at our local Wegmans grocery store, which is a brand new store that is actually an enormous shopping complex. It was nice, but, um, a little over the top. However, they had some fun items, for example, check out these mushrooms – more than 20 different types. pretty good sub, but no mushrooms…. This last photo is linked to the wpc for LOCAL – because we now have a second local Wegmans in our town. I grew up going to this store and so I thought it would feel familiar, but it did not. It is way different. I am not sure I even liked this one because it is a complex. They have a Pub eatery inside the store (a real restaurant) and they have another area with a cafeteria style eatery and tons of extra seating- they have the grocery store aisles and then all these extras. 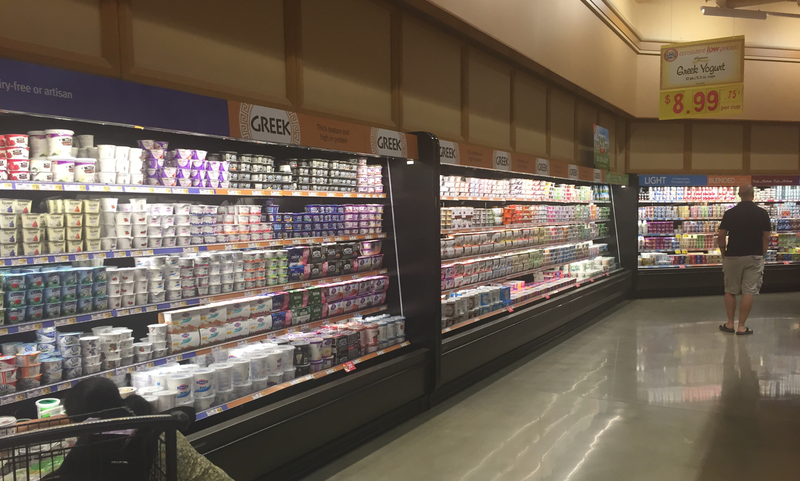 For example, they have an entire row of coolers for just Greek Yogurt. An entire row. Their wine section is larger than most of the wine stores in town. And the place we ate our “average” sub felt like a lodge. Not sure how much we will shop here. Guess we will see….The guy at the counter, who said his family moved here for a job at Capital One – well he asked us how I liked the store and I told him that it felt like a steroid version of Whole Foods mixed with a Publix. I will not be posting again until after October 28th – so let me say that I hope you have a great week! all those mushrooms! love mushrooms! Wow, that is a great selection of mushrooms. I do like them but I am wonder they can be used in any things or they only go with certain dishes. We do not have this store yet but I’ve heard that they were coming into area. I will definitely check them out. Hi YC – I really don’t know much about recipes for mushrooms, but I do know they taste great sautéed with real butter. And heard some supplements use certain mushrooms for immunity and healing from certain ailments. Girl, I have just had mushrooms for dinner and this was before seeing your inspiring monochrome rendition of them. Great capture of one of my favourite photographic subjects 😀 Thank you! Over the top for sure! Who knew that many mushrooms existed?! Well captured and creative response! I thought about doing a review of the store, or writing about the 30 pound halibut they had on ice – but the mushrooms were too fun! I like mushrooms sautéed in butter! But then discovered that mushrooms are a special fungi – they are jam packed with selenium and potassium – as well as fiber and vitamin D.
And I try to eat them more as an enjoyable immune booster! The table mountain inn in golden Colorado used to have the most amazing mushroom appetizer- and in the 90s i had no idea about how good butter was for us – and so felt guilty eating those butter laden shrooms – when in hindsight it was likely a gift to my health! Go figure! For me – it is “olives” I cannot eat! Olives probably are not overly good for you. I have developed a taste for some olives in the past 3-4 months when I tried a salad made with couscous and tuna. It was so yummy, I’ve become a fan of kalamata olives, regular black olives – blick! I’m also weird in that I hate shrimp, lobster, and pears – all a texture thing. oh so the textures bother you – I get it. And I would say olives are one of those “super foods” – and are really really good for the human body – and some say one of the most potent foods for health – I wish I could eat them – but I have other super foods – like chia seeds ground up – beets – etc. and your cous cous salad sounds so good right now. I love your photos, and your comment about the store being on steroids — hehe. That’s such a cool description. Gosh, look at all that fungi! There can’t be mushroom left on the shelf! Have s great rest of October and thank you again. Well I will drop by to chime in – I promise! Love ‘on the internet no one knows you are a dog.’ Oh my goodness, I enjoyed a good chuckle. 🙂 Enjoy your time off. Hope u have a nice week ! That was such a lovely outing! Thanks for sharing in Tuesday of Texture, I had never seen those mushroom before! Thanks Narami and many were new for me too! Love your fungus! Will miss you til the 28th. Going to check out the veggies challenge. I love Wegmans! Are they just coming to where you are? Over the top or not, I find it a step above the rest…. Hi – well yes – they are just coming to the area – because many years ago they had an agreement with Ukrops – our high end local grocery store chain – and I guess the agreement was to not cross certain boundaries. The Ukrops chain closed down in 2008 and sold a bunch of their stores to Martins – and most of those stores are now closing – they were not good. We have about ten Publix coming to the area and in Florida I really like those stores. Reminds me of whole foods! Lots of mushrooms! That sandwich is humongous! Reminds me of Whole Foods mixed with publix and then quadrupled -! But think that Publix makes the better subs – just satin’ hah! I’ve never liked WF sandwiches but then I don’t really eat sandwiches often. I love their bakery though! Eek…gotta stop talking bout food. And you are right – better watch the food talk. Getting hungry. I loved my corned beef sandwich at Carnegie in NY. I hear they are closing it! October 20, 2016 at .. Yes corned beef. Yummmmm! And I love Reubens too? I meant ! not ? I have never seen so many different types of mushrooms on supermarket until I live here! Sometimes I wonder which one is the tastier..any advice? What a great choice you have! I adore mushrooms and love cooking and using them! Happy to know you’re surrounded by good foods! When bloggers come back around – it is like running into an old friend at the grocery store! October 22, 2016 at ..
i funghi, che passione! un grande invito a passeggiare nel sottobosco, una lieta immagine della vita! October 23, 2016 at ..
mushrooms, passion! a great invitation for a walk in the undergrowth, a happy picture of life! I do prefer my mushrooms shaped like … er … a mushroom! But I do like them fresh. When canned, they don’t leave mushroom inside because they have to fill them up. October 26, 2016 at .. I love the big mushrooms. I steam them first, then saute them and then add my stuffing with cheese and bake. These upscale grocery story have top quality everything but are expensive We call Whole Foods – Whole Paycheck ! Thanks for your recent visit to my blog. Hi carl! Yes / we used to call Whole Foods the whole paycheck as well. It surprisingly – wet and is noted for decent prices. And your mushroom preparation sounds really good! We don’t have Wegmans up here, but I’ve been to them in Philly and DC – yes over the top, but kind of cool…. A lot of mushrooms there. Actually i was closer to Mananas at the time. October 27, 2016 at ..
Yay! A mushroom party 🙂 My daughter says she cannot cook without ‘shrooms! wow – she must really like them…. October 29, 2016 at .. I was once asked to delete all the photos I had taken in a local Supermarket by a rather obnoxious manager who seemed to think I was ”spying” for the opposition. Wow – how rude is that! And paranoid! I wonder what the legalities are with that. No idea but I am very circumspect walking around with the camera after that! November 5, 2016 at ..
October 30, 2016 at ..
and it sounds like you can have that simple kind of wonder and fun to explore… and some of these stores are cool. November 8, 2016 at ..
November 11, 2016 at .. I know – most stores usually carry a few…. November 13, 2016 at ..
November 14, 2016 at ..
November 12, 2016 at ..
Great post.I never has seen so much sorts in a shop.Thanks also for following my blog. Discovered your Friday Food Challenge thanks to ‘Restless Jo’. She mentioned you as I got carried away with fish the other day . . even more fish than your mushrooms! Oh now I am curious – and I just captured some fish last night! So I look forward to see my your fish! And I must thank Jo later for her sharing! This challenge is Just for one year and I have learned already!